Agents of P.O.N.I. - Party Organization and Networking Initiative. This group of hardworking ponies spend much of their precious free time planning and organizing the big events that you and your pony friends attend in Legends of Equestria. They could be socializing with friends, playing other games, reading a book, or even going 'outside' but they choose to follow the long and difficult road of making sure that there's always fun things to do in this beautifully crafted world of fantasy and talking horses that we all live in. So this space is where all events past, future, and present, planned by P.O.N.I. or by other friends of LoE who just want to plan fun events can mention what they're working on. Please feel free to post your events here as well. After all, we are all one big family and no one pony is more important than any other. Please thank anypony you meet who works hard on these events as without them, LoE would be a lot less fun. Also if you want to join P.O.N.I. just feel free to ask. We're always happy to have more help. And on March 24 (this Sunday) at 8PM GMT, please join us at the Cantermore Castle training area to participate in a contest to earn the right to join the Royal Guard and win fabulous prizes. Spectators are welcome! And PONI is working on a special Easter event at the end of April. Be looking forward to this. This last weekend was ah-mazing! So many great ponies around. Some great games of Truth or Dare and Hide and Seek being played. And to top it all off, we had a super spectacular party on Sunday night thrown by my good friend and fellow party pony Fluffy Cloud. It was off the hook excitement! There's been so many cool ponies around lately and so many events. But the best is yet to come tomorrow night for my Hearts and Hooves party is upon us! Show up at SCC in Ponydale at 7CST (or earlier because you know I'll be there getting the party started early) for lots of fun games and dancing with single ponies just like you. Or for those who want to bring a date there will be a couples mingle as well. Also we have a very special birthday coming up on March 1st. Our friend and resident pony guide and helper Jet Black is turning one year older. Jet does a lot for the newer players in the community and deserves some (but not a ton because it'll go to his head ) of recognition. I'll be setting some more exact details for his party soon so please keep that one on your radar! I hope you all keep having fun and I can't wait to see you around! What could this be I wonder? YAY! A new party pony! Quote from: Holiday Cheer on 2018 Feb 14, 12:39:47 What could this be I wonder? 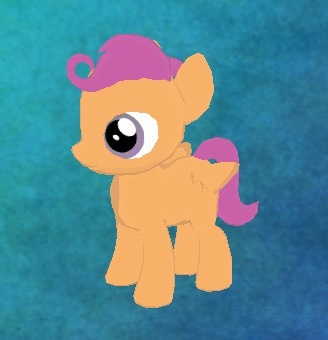 Scoots, we've met now I think so you know me, but that's a recolor art that my friend made for my RP plot from Feb 14-17. I'll share more of the story behind it very soon. I've been getting slammed with wedding season being upon us (apparently) and I wanted to say something about this. But first let me ask everyone who is currently active in LoE to please please please be online tomorrow evening (roughly 5-9 CST) for the party event of the year! So there's been a lot of ponies getting married lately and I've been getting asked repeatedly to plan weddings. This is something I LOVE DOING and I'm more than happy to help you ponies out. However when it comes to the actual wedding planning and performing the wedding I'm not really doing that much. I've talked with ponies and helped them get ideas of what they'd want for their ceremony and sometimes I help them get connected with the appropriate other ponies who can help them. However, I am getting a HUGE amount of the credit for these weddings with I DO NOT DESERVE. There are some other amazing ponies out there who do a LOT for wedding events on LoE and they deserve more of the credit than me when it comes to the actual wedding. I would like to mention two here, but there are plenty of great party and event planners and plenty of ponies who stand in as best mares/stallions that help out a lot too. Jet Black is always willing to step in as a best stallion at the last minute and is always happy to play wedding photographer and create Youtube recordings of the weddings. This kind of memory is a treasure and he deserves your thanks. Blue Cloud is the BEST wedding ceremony performer (priest) that there is. He has a great oratory for weddings and always puts a special touch on it to make it special for the happy couple. Plus he helps make sure everypony knows what to do and where to stand and basically does everything than a real-world priest would do.. These things would not happen without him and I never see anypony publicly thank Blue for all he does. So please do this for me in the future. I don't mind a 'thank you' when I've done something, but at least please have the courtesy to thank the other ponies who helped you with your wedding too. Quote from: Holiday Cheer on 2018 Feb 28, 15:24:08 Scoots, we've met now I think so you know me, but that's a recolor art that my friend made for my RP plot from Feb 14-17. I'll share more of the story behind it very soon. And I wanted to ask about this anyway.^^ We should talk about this in Sugarcube Corner. Hello Holiday! Most of my ponies have a quill and parchment cutie mark, so I'm an author. If you ever need somepony to hire to write stories for a certain party like maybe a "Campfire Night Party" or something like that, I'm really good at it. It's my Cutie Mark, after all! Consider me, please! Oh, and the pony who does all the author stuff is Playwright Producer. Cloudy, as always you've got my vote. I should actually hire you to try and keep track of what happens as Sapphire's roleplay events. That last one got really crazy and I was really confused so I had a hard time explaining it back to her later. We're doing another one this coming Sunday (March 11) at 5 PM CST, so if you can come that would be amazing. The plot is gonna involve curing a sudden outbreak of the flu that is sweeping across Equestria. And speaking of big events! TONIGHT TONIGHT TONIGHT one night only we'll be having a two for the price of one sale on parties and I'm talking PAR-TAHYS! Our friend Woven (Commander/Discorded) will be returning from a recent vacation which has kept him away from Equestria and we're giving him a proper welcome back party at 6 PM CST. Then, later on, probably around 8-9 PM CST, we'll be having a birthday spectacular for Scoots Shade (not the Scoots that's my forum buddy) who is a long time friend for a lot of us! So please come and have a piece of orange cake! Thanks Holiday! I'll be honored to keep track of Saph's roleplays. I'll try to be there, I need to check my calendar. But I'll probably be there, I first need to see what time it is when its in EST time. I missed the birthday party for Scoots Shade because I'm coming down with something..... Is there still some of the orange cake left, Holiday Cheer? Sapphire had just woken up with her horn broken! She called her friend Holiday Cheer to ask for help. Holiday Cheer called some other ponies, including me. We all met at the library in Ponydale, and looked for a cure. I finally found one, with my magic skills, I was sure I could pull it off with some help of Blue Cloud and other ponies to find the ingredients. We needed Poison Joke, Lavender Blossoms and some Magenta Leaves. Blue and his team searched for Poison Joke, Holiday and her team searched for Lavender Blossoms and me and my team searched for Magenta Leaves. Once we found them, we met back in the library and performed the spell. It worked, until I figured out that Poison Joke made it temporary, we had 24 hours until her horn exploded - her with it. None volunteered. But I discovered that we could create a horn out of Pegasi Wings. Slash volunteered... we didn't know that it would kill him. Slash turned into an angel, and we tried to save him. We couldn't, though the LeaderOf TheAngels could. He decided to let Slash go through trials and if he passed he could leave, if he didn't he could never visit the mortal realm again. It was March 11th in Equestria, all was well until a sudden flu outbreak infected all of Equestria. 6 were left though... Me, Blue Cloud, Holiday Cheer, Sapphire MoonLight, Pastel Shades, and Amphram. We all decided to split up to look for supplies and cures, Sapphire, Holiday and Blue went to Crystal Kingdom to look for cures in the library and to look for medical supplies in the hospital. I went to Cloudopolis, to go to my house becuase I have tons of books and to stop by the hospital. We all exchanged walkie talkies so we could talk to each other. Suddenly Amphram cut the signal saying "Common... **** Cure... ***** me... **** Bramble... ***********"
We rushed to get a cure, honey from a Flash Bee hive. It worked, for a while. We left Sapphire there when something mysterious attacked her. She got moved to the bridge by the campsite and was unconcious. There was slashes everywhere, we woke her up and then something hit me. I didn't know what and neither did they, but it backfired the honey from the Flash Bees. It made me turn into the tree that drops the flower to make Swamp Fever. Sapphire tried to help but couldn't... then something weird happened. The same wounds Fizzlepop Berrytwist had. That means she was attacked by an Ursa Major. Also I'll try to be there for the Winter Wrap up. It's Winter we must clean. How can I help? I'm new, you see. Applejack: 'Cause tomorrow Spring is here! Rainbow Dash: 'Cause tomorrow Spring is here! To let the sun shine in! When the sun comes up, it's warmth and beauty will glow! Under the snow and ice. Rarity and Fluttershy: So their families can grow! It's just so much to do! Tough task ahead I face. Help the earth pony way? CMC Scoots, I'll happily save you some cake. It's still good. Cloudy, thank you for the RP updates. This is a fine place to post them. Buuuuuut. I just realized that TODAY is EQUESTRIAN NATIONAL PIE DAY! This is Holiday Cheer's all time favoritest holiday of all time! 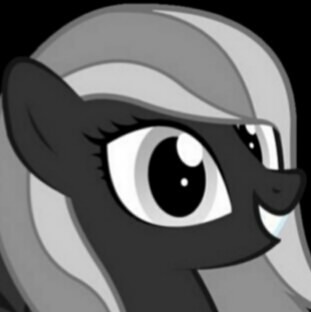 So I will be on LoE this evening handing out pie to each and every one of you ponies! Have some pie and celebrate. And I update a time for the St Patrick's day party, so please check that out. (It's at 4PM CST on Saturday). If anypony has good ideas for the Winter Wrap Up Event please share them. And finally, some news. It seems I have adopted a filly version of myself. So if you see Lil Holiday around, please say hello and be kind to her. Also if I ever get annoying with that, please please please tell me. I don't want to be and I'm sure neither does Lil Holiday. Hey everypony! Unfortunately I don't have any exciting party updates at the moment but I have been working on new song lyrics. Enjoy. And you're really great at writing song lyrics! You should find a musician to sing them for you and add instrumentation! Quote I am in the process of planning a big time Easter special event right now that will probably be something like super special hide and seek (see my post in the Easter topic) but I promise it will be fun! So this might be kind of a long post. Got a few announcements and a story. First of all is an OOC type thing. I probably won't be on LoE a ton in the upcoming weeks. I mean I'm going to plan to be on there as much as I can and I want to. I'm just moving soon and will need to be packing and dealing with life more and more as the date approaches. What can you do? Second, an LoE announcement for kind of a last minute thing but I'm throwing a special party tonight in honor of my friend and fellow party pony Fluffy Cloud who has just been feeling down lately and needs a boost. Just feel free to stop by SCC this evening (US time, sorry my overseas friends) and say hello. And finally, I keep intending to share the story of Midnight Roulette, but it's kind of difficult for me since it was traumatic. I did sort of almost die. But my friends tell me that pony has been sighted in Equestria again and I want everypony to know the story so they can be prepared. On February 14th following my Hearts N Hooves Day Party, I was suddenly transported by magic to a dark place, trapped, and alone. A black coated unicorn with a mane of firey red and gold appeared and introduced herself to me as Midnight Roulette. She told me I was a mistake. That my existence was a threat to the stability and peace of Equestria and that she was going to make sure that I couldn't hurt anypony. I didn't understand what she meant. I only want ponies to be happy and to celebrate friendships with each other. 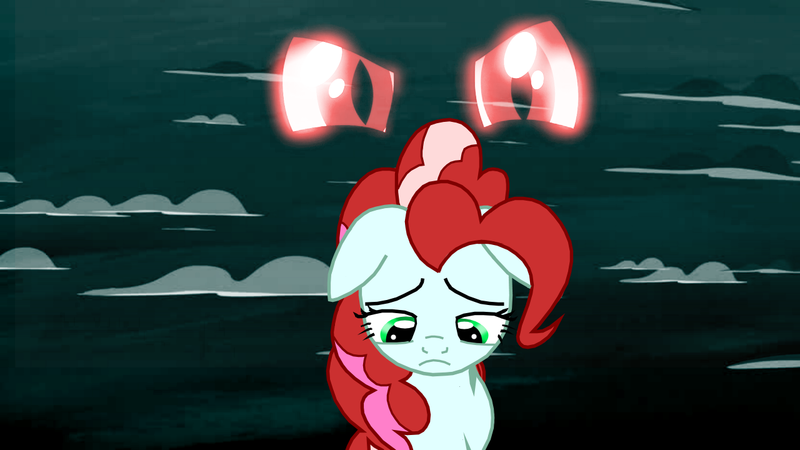 I could never hurt anypony. But Midnight insisted that as long as I was alive and in Equestria there would be problems, ponies would be disconnected from the world, there would be times when the entire world blinked out of existence, and finally the world itself would cease to exist. I was then and am still afraid that what she told me might be true. But this Midnight pony liked to play games and she gave the other ponies of Equestria a chance to save my life. 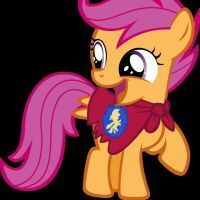 She appeared in SCC and provided riddles leading to places where she would meet the ponies who played her game and she would answer a question each night so that they could learn why she was doing this. For four days she played this game and if on the final day they managed to solve her last riddle she would provide my location to them. What they didn't know is that she was merely stalling for time, hoping that my strength would run out before they finished the game. A group of ponies stepped forward to fight against this wicked game: Watermelon Zest, Jet Black, Nightdust Glow, Starburst, Tide Pod Pony, Slash, Gloomy Feathers, and Marshmallow Cactus to name a few (and if you were there and I've forgotten you please please please remind me because I want to honor you too). Midnight's riddles lead them to the Roof of the Crystal Castle, The Rainbow Factory, The Carousel Boutique, and finally to her lair among the Dark Rocks in the Heartlands. Each of these places chosen for symbolism to what she was trying to warn the ponies about. They asked about her motives and she explained that I was a mistake she was trying to correct. She pleaded with the ponies to see her perspective but in the end they would not listen and she attempted to have the naiads of the Heartlands destroy the ponies for her. In the end, Slash threatened to end her life and only then she revealed that I had only minutes remaining where she had left me among the Poison Joak fields of the Evershade Forest. Midnight was able to escape as the ponies scrambled to save me, promising she would return to finish her work. And it seems now she has. I have foals now that I am worried for and a growing family. I don't know how to protect them all from this wicked pony who seems to think that I am somehow responsible for all of Equestria's problems. Whoa! Your really talented in writing poems and lyrics! You should be a poet! You're sweet Cloudy and a good friend. Thank you! I have a couple updates and want to gush about something. First I'll be moving in a couple weeks and so probably won't be on LoE as much as I have been in the past for a little while. I mean I'll probably still get really lonely for my ponies and come on there anyway, but I'm not planning any big events for a while. However, there is still the CMC Scoots Easter Egghead Hunt this weekend! Sunday at 8PM EST (7PM CST, etc). Please join us because it's sure to be egg-citing and will be the perfect way to enjoy and celebrate the new Winter Warm Up Event going on in the game! Also there will be a wedding for Fwuttershy and Fire Blaster on Saturday, March 31 at 8PM CST at the Crystal Heart in Crystal Kingdom. Please come and celebrate with these amazing ponies! You know there will be an amazing afterparty too! For outside, all is bleak, all is cold"